After some thinking (and walking around like a robot), I am done designing its range of motion. It ended up becoming fairly close to a normal human, but with some differences. Hopefully these differences are enough to give the feeling I wanted as explained in the previous post (without making it too alien). I will go through the different parts below and explain why I did what I did. First we have the arms. I didn't specify the hands and all their joints since they will behave just like a normal hand. The differenece is that I will give it 4 fingers instead of 5, since you don't really need that many to comfortably do most things. The fingers themselves will be left unimpeded though, just like on a normal human hand, since I want to keep some part of him delicate and with full control. Several important moments and actions are performed with his hands in the script, and I don't want them to look clumsy (when he works with the cotton at different times). As for the rotation of the hand, I moved that to the elbow, rotating the entire forearm in one piece (instead of a bending forearm as people have). Placing the rotation there instead of at the wrist has the risk of looking a bit weird, since the rotation of a hand on humans looks closer to the wrist than elbow (since that is the part that is actually turning). However, this decision was to prepare for a kind of piston/muscle system I am imagining for the joints. Having a rotation close to the tilting part would leave no space for the muscles (this will be explained more clearly later, but to get an idea of what I will be going for when I talk about pistons and muscles, you can look at the robot leg test I made in the introduction video). 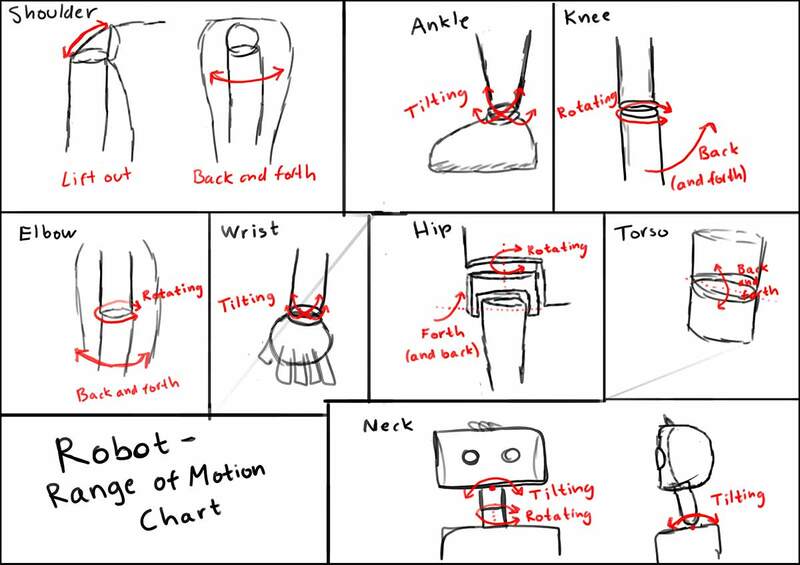 The legs are very similar to the arms in that the ankle only does tilting, while the rotation is passed to the joint before, rotating the entire shin in one piece instead of having deformations of any kind (or a rotation close to the ankle). As for the hip, I think it will work well without the lifting out-motions we humans have (straight to the side like when doing some kind of yoga). It should be able to be simulated fairly well by simply rotating the leg and then lifting it (rotating the foot in the opposite directing to keep it faced forward if that is needed). The torso could really be one still piece of metal with no joints at all, but I decided to give him the ability to bend his upper body. Hopefully this will give a bit more expression in both movement and feelings, as well as naturally bringing some mechanical detail to the otherwise single largest pieces of the robot (now essentially splitting it into to). After some small experiments, I think he will look cuter and more innocent if his tilting of the head is done right by the edge of the head, like a meerkat or something. That while keeping the tilting back and forth at the base of the neck to get a more of a leaning feeling. So, that's it. Until next time, I will actually design these joints, showing how different mechanical parts will interact to give these movements. The final aesthetics will be left for later when I know how the entire Robot will work, because then I can more easily draw the robot as a whole, trying to find the right look for it.